• Pram Changing Bag & Mattress • Isofix Base for Car Seat • Extendable UV50+ hood. • Pushchair Reversible Seat Liner • Raincover • Extra Large Shopping Basket. The Jané Muum is a new concept in pushchairs that combines the latest design trends with the most innovative safety and comfort features. It has a light-weight chassis and folds without having to remove the pushchair seat unit. 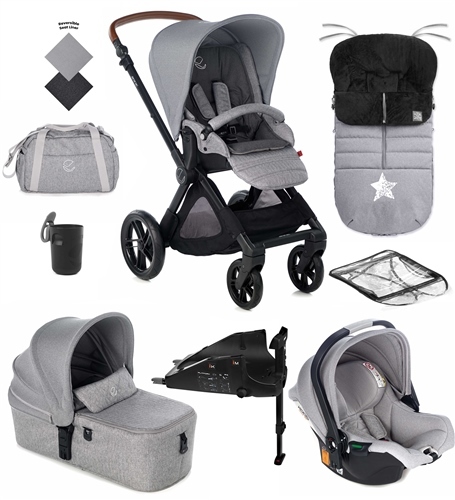 Adaptability is key to this excellent pushchair, which converts easily thanks to Jané’s Patented Pro-Fix system which locks and unlocks the carrycot or car seats with just one movement. The Muum's seat unit adapts at all times to the most appropriate position for the baby's back, because of its independent 3 position backrest and footrest. It's versatile enough to suit newborns right through to toddlers. It’s one of the most comfortable models on the market due to its well-designed roomy seat. Keen to make life as easy as possible for busy parents, the Jané Muum features a large capacity shopping basket so you can carry everything you need effortlessly. It also has a reversible seat unit so you can have your baby facing you as you walk. Its smaller lighter swivel front wheels with independent suspension, are perfect for getting about on the city streets. And its large removable rear wheels make the pushchair fold up even more compactly, making it easier to carry and store wherever you decide to take it. The Muum makes everything not only better for you but also easier and more accessible. The Muum from Jané; for more comfortable walks. Pro-Fix system (patented) locks and unlocks car seats with just one movement, eliminating the need to use awkward fitting kits. Easy accessible large capacity shopping basket. Smooth ride lockable front swivel wheels with cantilever suspension. Removable and reversible seat liner, raincover and pram bag with changing mattress included. 7 positions: 78-108cm hardwearing PU ergonomic handlebar. Book type compact folding system with carry handle. 3 Position, full reclining lie-back seat unit with adjustable footrest, suitable from birth. Height adjustable soft touch ergonomic handlebar, 7 positions (78-108cm). Quick release rear wheels for more compactness when folded. Removable and reversible seat unit. Reinforced seat unit with a honeycomb structure means it’s lightweight and strong. 100% aluminium tubular chassis. Free stands when folded. Chassis can fold with seat unit still attached and has a carrying handle which makes it easier to carry when folded..